For the last several years, the US recovery following its experience with the global 2015-16 downturn has been lacking in several key dimensions. Reflation #3 in the real economy has reflected the lack of momentum and altitude in the snapback across the eurodollar system. As such, of all the reflation episodes this last one was upside down; it was by far the weakest and yet it was constantly claimed to be the strongest. Had the rhetoric been at all grounded, the chief proponent advancing the cause would have been the business sector. Recovery, actual recovery, is an opportunity for productive growth. Industrial as well as service sectors firms would’ve spent the past almost three years literally building for a meaningful upswing. They didn’t. Instead, a curious flatline in capex followed along with a slowdown in the labor market. Tied to unusually weak profit expansion from the 2016 trough, the US business sector played it very cautiously all throughout. It was a clear “wait and see” approach; heeding central bankers’ constant optimism but demanding proof first before actually committing heavily to it. 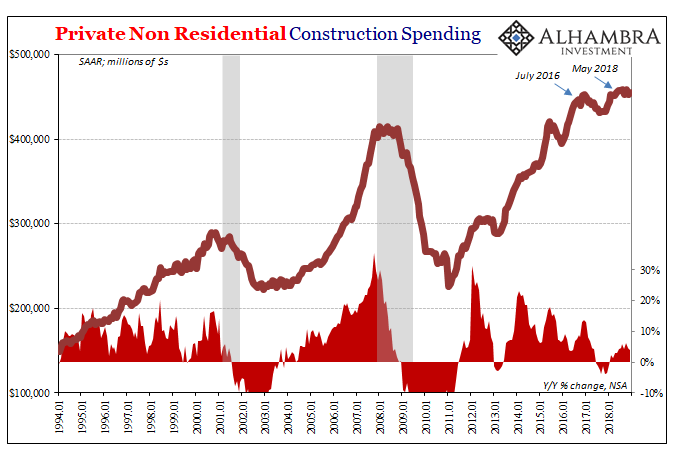 In terms of construction spending, non-residential activity was estimated to have been about the same in December 2018 ($454.5 billion, SAAR), according to Census Bureau figures released today, as of July 2016 ($442.1 billion). For two and a half years, sideways. The boom could only have been figurative and nothing more. With the federal government shutdown forcing delays in the final data for 2018, we are forced at the beginning of March 2019 as it finally comes out to review just how weak last year had become by its end. By the end of 2018, non-residential construction was actually left to be the strongest (least bad) part. After cleaning up for hurricanes Harvey and Irma, state and local governments pulled back in the last several months of last year. Public construction spending would peak around last August, with most of the upswing having been completed around May. Back to austerity again, as the neo-Keynesians will say. What is really scary about the housing market is not construction, but how dependent it is on rising rental rates and the fact that many areas already can't support the rates they are charging. The main reason rents have become more unaffordable is because increasingly residential homes are being bought out by real estate speculators and funds and often lots of houses sit on the market empty or are used to push up the speculative bubble. Tax breaks for property ownership should be stripped from those buying property not to live in them. The unaffordability in housing is a central point in why the economy can't get a strong foothold for growth anymore.